John Gilstrap's pulse-pounding serial together in one book for the first time! A pulse-pounding novel of two young lovers on the ultimate joyride—racing against the clock and against the law . . .
Nicki Janssen’s days are numbered, but she refuses to accept her fate lying down. Defying her father and doctors, she hits the road with a pocketful of cash, a bus ticket—and a romantic fantasy of riding off with her childhood crush . . . Handsome, dangerous Brad Ward is facing a different kind of sentence. Sent to prison for felony murder, he has escaped and rekindled his relationship with Nicki. But when Nicki’s father joins forces with a deputy sheriff, the search for the runaways ignites a manhunt—a blistering chase that accelerates with every stolen car, every act of violence . 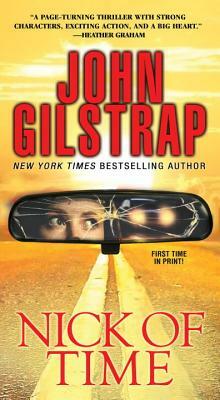 . .
John Gilstrap is the New York Times bestselling author of the Jonathan Grave thriller series and other fiction and nonfiction. His novel Against All Enemies won the award for best paperback original of 2015 given by the International Thriller Writers. His books have been translated into more than twenty languages. An explosives safety expert and former firefighter, he holds a master’s degree from the University of Southern California and a bachelor’s degree from the College of William and Mary in Virginia. He lives in Fairfax, Virginia. Please visit him on Facebook or at www.johngilstrap.com.